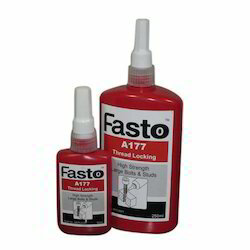 Item Code: Fasto-A177Fasto A177 is high viscosity and high strength thread locking compound. A177 finds its applications for locking assemblies of conveying systems, foundation bolts, automobile chassis and other assemblies in Industrial & automobile industry where high or permanent strength is required. Effective on all types of metal threaded fasteners.Threadlocking Prevents loosening on vibrating parts such as pumps, motor mounting bolts, gear boxes, or presses. Recommended for use where disassembly with hand tools is requried for servicing and where parts are contaminated with oil. NSF / ANSI 61. Agriculture canada Approved. 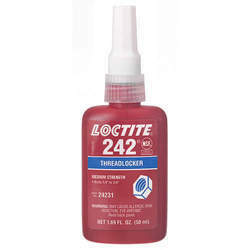 Effective on all types of metal threaded fasteners.Thread locking Prevents loosening on vibrating parts such as pumps, motor mounting bolts, gear boxes, or presses. Recommended for use where disassemble with hand tools is required for servicing and where parts are contaminated with oil.